A microscopy expert at UC Berkeley has won a grant to purchase an amazingly powerful new microscope that will enable scientists to study the tiniest of organisms. 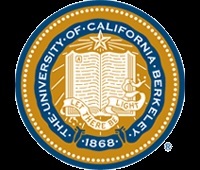 “This new microscope will enable researchers to see objects that are impossible to see using technology available at Berkeley today,” said Steve Ruzin, director of the Biological Imaging Facility, located on the UC Berkeley campus in Koshland Hall, in the College of Natural Resources. Ruzin is an expert in microscopes and his cutting-edge Biological Imaging Facilty serves thousands of faculty, students and staff. Not only are a wide variety of microscopes available for researchers to use, but the lab also teaches students and other researchers about microscopy, the technical field of using microscopes to view samples and objects that cannot be seen with the naked eye. The new $600,000 instrument, purchased with a National Institutes of Health grant, is a “Structured Illumination Microscope” that allows researchers to image and differentiate different parts of a cell, using different fluorescent dyes. “In microscopy, and any optical system, to ‘see’ something is the ability of the system (microscope, telescope, eye) to determine whether two closely spaced objects are, in fact, two objects or really only one larger object,” Ruzin said. This “limit of resolution” is determined by the wavelength of light that is used to illuminate the sample. The resolution limit was defined in the 1880s by the German scientist Ernst Abbe, and it is still valid today. The period at the end of this sentence is about a millimeter in diameter. 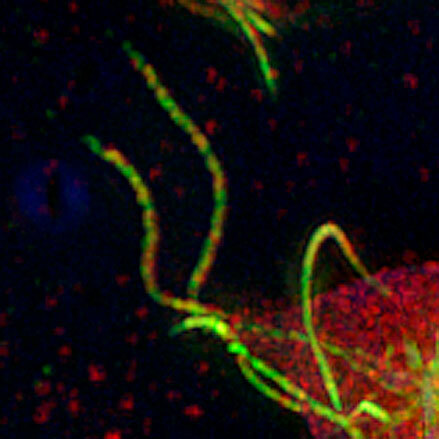 A single bacterium is 1,000 times smaller than a period, or about 1 micrometer. In the last few years three separate technologies have become available that overcome the limit of resolution. The new microscope uses one of these technologies called “Structured Illumination,” that illuminates the sample with a known pattern of light. The illumination pattern induces a complex light pattern that is emitted from the sample. Subsequent computer processing of the emitted pattern reveals sub-resolution structures within the sample. The new microscope will achieve a resolution of 100nm, and will be able to see objects that are 10 times smaller than a bacterium, or 10,000 times smaller than a period. Arash Komeili’s lab in the Department of Plant & Microbial Biology is one of the many labs on campus that will benefit from the new instrument. The Komeili group studies magnetosomes, bacterial organelles 50-70 nm in diameter that control the formation of magnetic nanoparticles. Due to their small size and tight arrangement within the cell, conventional fluorescence microscopy cannot distinguish between individual magnetosomes. “We anticipate that the improved resolution of the Structured Illumination Microscope will allow us to study the dynamics of specific proteins at the individual magnetosome level,” Komeili said. Ferroelectric materials – substances in which there is a slight and reversible shift of positive and negative charges – have surfaces that are coated with electrical charges like roads covered in snow. Accumulations can obscure lane markings, making everyone unsure which direction traffic ought to flow; in the case of ferroelectrics, these accumulations are other charges that “screen” the true polarization of different regions of the material. Ferroelectric materials are of special interest to researchers as a potential new form of computer memory and for sensor technologies. 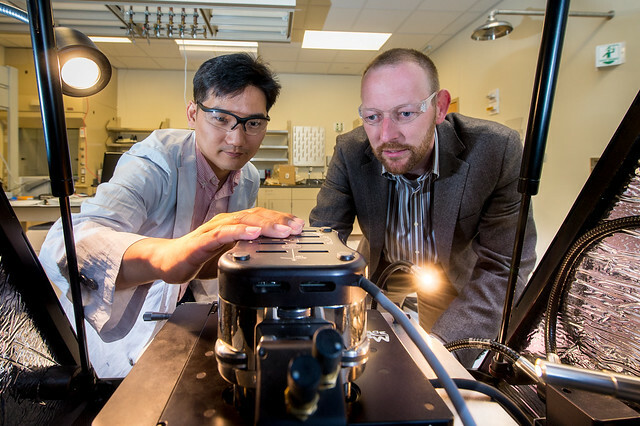 Argonne materials scientists Seungbum Hong (left) and Andreas Roelofs adjust an atomic force microscope.Photo credit: Wes Agresta/Argonne National Laboratory. In order to see this true polarization quickly and efficiently, researchers at the U.S. Department of Energy’s Argonne National Laboratory have developed a new technique called charge gradient microscopy. Charge gradient microscopy uses the tip of a conventional atomic force microscope to scrape and collect the surface screen charges. Ferroelectric materials are not usually polarized in any particular way, but they are rather the combination of different domains that are each polarized in different directions. “The end goal of the research is to be able to map these different regions quickly and accurately,” Hong said. Previous efforts in this arena had focused on the application of a different kind of microscope using piezoresponse force microscopy (PFM). In this technique, an applied voltage causes a small displacement of atoms in the material, generating a noticeable mechanical effect, or vibration. In reverse, the same phenomenon is responsible for the workings of the lighters in gas grills. “Now, everyone can use a standard tool to do this work much more cheaply and efficiently,” he added. An article based on the study appears in the April 23 early edition of the Proceedings of the National Academy of Sciences. This research was funded by the U.S. Department of Energy’s Office of Science. Argonne materials scientists Seungbum Hong (left) and Andreas Roelofs adjust an atomic force microscope. Click to enlarge. 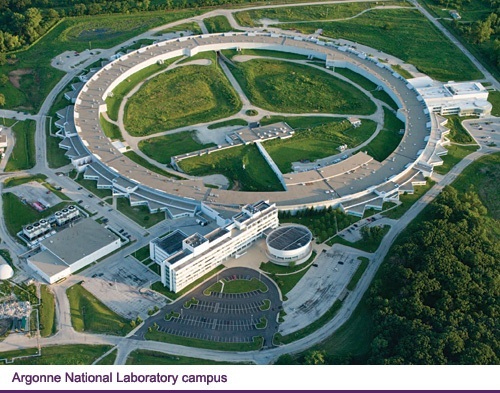 Photo credit: Wes Agresta/Argonne National Laboratory. Researchers at MIT, working with partners at NASA, have developed a new concept for a microscope that would use neutrons — subatomic particles with no electrical charge — instead of beams of light or electrons to create high-resolution images. Among other features, neutron-based instruments have the ability to probe inside metal objects — such as fuel cells, batteries, and engines, even when in use — to learn details of their internal structure. Neutron instruments are also uniquely sensitive to magnetic properties and to lighter elements that are important in biological materials. “Engineers at the California Institute of Technology (Caltech) have devised a method to convert a relatively inexpensive conventional microscope into a billion-pixel imaging system that significantly outperforms the best available standard microscope. Such a system could greatly improve the efficiency of digital pathology, in which specialists need to review large numbers of tissue samples. By making it possible to produce robust microscopes at low cost, the approach also has the potential to bring high-performance microscopy capabilities to medical clinics in developing countries. ‘In my view, what we’ve come up with is very exciting because it changes the way we tackle high-performance microscopy,’ says Changhuei Yang, professor of electrical engineering, bioengineering and medical engineering at Caltech. 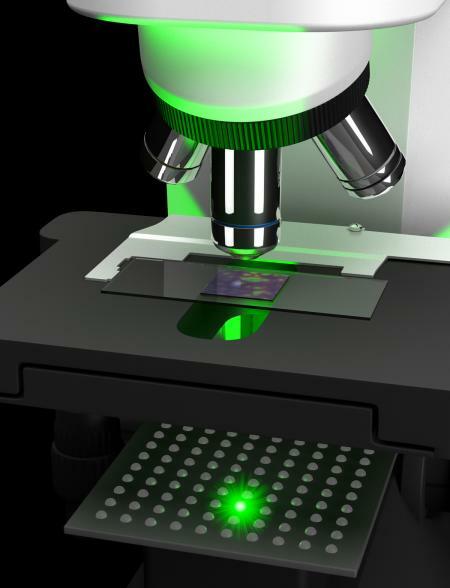 Artist’s rendering of the new microscopy setup showing one element of an LED array illuminating a sample. Yang is senior author on a paper that describes the new imaging strategy, which appears in the July 28 early online version of the journal Nature Photonics. Until now, the physical limitations of microscope objectives—their optical lenses— have posed a challenge in terms of improving conventional microscopes. Microscope makers tackle these limitations by using ever more complicated stacks of lens elements in microscope objectives to mitigate optical aberrations. Even with these efforts, these physical limitations have forced researchers to decide between high resolution and a small field of view on the one hand, or low resolution and a large field of view on the other. That has meant that scientists have either been able to see a lot of detail very clearly but only in a small area, or they have gotten a coarser view of a much larger area.